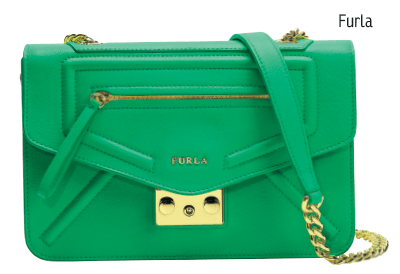 TAKE a chance and experiment with Furla’s new and exciting spring/summer 2015 collection. With eye-popping colours, painted effects and elegant design, the latest range does not disappoint. The collection is inspired by the Neo-Pop artistic movement which is a post-modern interpretation of Pop Art. By playing with fashion, art and graphics, the theme is a mixture of upbeat energy and understated elegance. By combining new styles in lively funky colours such as sunshine, hibiscus orange and ocean blue, the collection is juxtaposed with gentler shades of white, grey and dove. All bags under the Furla label have the unmistakeable Italian craftsmanship. This season, each bag is given a unique touch and there are plenty of styles to choose from. Colourblocking is used with great effect on the new Furla Twist bag to give it a distinctive personality. The Twist bag is a versatile and labour-intensive bucket-shaped shopper that is complete with a metal bar and a woven inner compartment — a perfect bag to take you from the office to the weekend. For ladies opting for a more relaxed look, the Spy backpack in soft nappa and suede is a great pick. It is effortlessly stylish and the soft-edged, user-friendly backpack is adorned with either mini or macro flat studs in burnished metal which give off a fun and graphic polka dot effect. For a night out bag, the Metropolis and Alice crossbody bag are good choices. The Metropolis is a small chain-strapped bag that is characterised by hand-stitched padded details that trace geometric motifs down the front as well as a clasp that features multi-colour rubber coating. The clasp is available in pretty colour combinations and has a lego-like effect on the bag. The Alice crossbody bag has a clean and sleek aesthetic making it easy to pair with any outfit. It is also available in a tote version which keeps to the same design aesthetic. The iconic Furla Candy Bag is back this season in an explosion of colours and opposing textures. The new versions include resin brush-stroke effects which vary from subtle trickles to bold splotches all rigorously hand-applied to make each bag one of a kind. 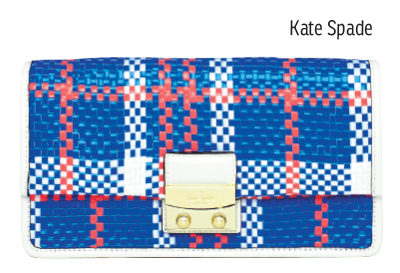 Kate Spade New York’s spring collection is one about escaping the ordinary with pieces that are inspired by adventure. The silhouettes exude an elegant and relaxed vibe with subtle athletic influences. Cropped tops, midi skirts and A-line dresses feature strongly throughout the collection sticking to bright colours and graphic print with an eye for detail. The key details from the ready-to-wear collection include leather panelling, scallop detailing and exterior zippers that are bound to jazz up outfits. The Madison Avenue exclusive pieces from the collection feature pieces with a classic aesthetic with floral appliques on silk and cotton blend pieces as well as a luxe pool print on a dress, midi skirt and top. The handbag collection sees a variety of styles full of whimsical inspiration. The Novelty range this season features an oversized heart tote, eyes and lips clutch, resin ladybird clutch as well as a family of wicker pieces. The wicker pieces include a frog, clam shell and snail, all of which have a strong touch of nostalgia. Travel inspired styles are also prominent in this collection with the Cobble Hill Luxe travel sami bag and Nylon international carry on suitcase designed to make you head on your next adventure in style. If you prefer more classic styles, your go-to picks should be the Aubrey bag, Maise bag and Babe tote. Athletic influences are found in the Bay drive range of bags which are made from woven plaid raffia and smooth leather in black and blue plaid. The Esta street group also channels the athletic trend with neoprene bag in bright colours in four styles to choose from. The accessories from the collection further channel the whimsical spirit of spring and will come in handy if you have a chic garden party to attend. With accessories such as bucket hats in tiered raffia and embellished flowers, it is easy to see how Kate Spade New York has channelled the essence of spring into the collection, taking one to a world of fantasy. The range also features a shell-shaped gold necklace, snail necklace and a cute ladybird cuff all of which are easy to mix and match pieces. With all these pieces from the collection you will have no problem “escaping the ordinary” this spring/summer.